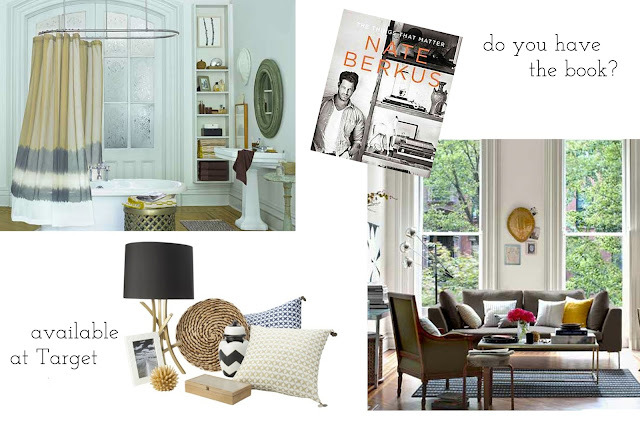 I feel like I am the only blogger who hasn't run out and purchased The Things That Matter by Nate Berkus. I have, however, perused his new Target collection online and may have to pop in for this chevron accent piece or this gold lovely. I am literally obsessed with ALL of it and I need to get the book asap. That book is my wishlist and his collection looks incredible! I so need that book:) Have a great day, lovely. Nate Berkus is my fav and I am so excited he has a Target line now.... and looks like I will have to be purchasing this book as well! Gosh, I haven't bought anything from his new line. I saw it last weekend, but there wasn't anything that I HAD to have. I love his line, but for some reason, I don't think that the items would really fit well in our apartment. Although, I do love the gold bowl and there is a lovely chevron picture frame. I think I need to go back! I have the book and it's really great eye candy. But I love Nate's style and would buy any book he puts out. I did buy a few pieces from his new line - a couple of boxes to stash things like eye mask and cuticle oil on our nightstands, the roped hurricanes for centerpieces, and a pillow I loved. I wouldn't buy ALL of it, and he specifically says he didn't want people to...that you should get a piece or two that fits into your home and what you've already got. Thankfully, it wasn't as big of a mad dash like Missoni. Our Target still have plenty of the items left.